The Simian constellation represents are link in us to the animal kingdom. This is a very basic constellation that represents the animal urges within us. The simian ape is a powerful primate which lives upon its basic wit within the wild. The simian is both adaptable to nature and can read the feelings of others, as well as being very manipulative. The simian's emotions are raw. Thus this constellation is an underlying one influencing us at the basic level. It can be very powerful, or it can be totally suppressed by our other characteristics. The simian line is a merging of the heart and the wisdom line. Thus the simian constellation can be very powerful as it blends mind and wisdom together under strong emotional influences. The simian constellation is therefore latent in many of us, but can arise under certain circumstances, like hardship or stress. The simian line is often misinterpreted by many palmists. Many believe that it shows the characteristics of a criminal. 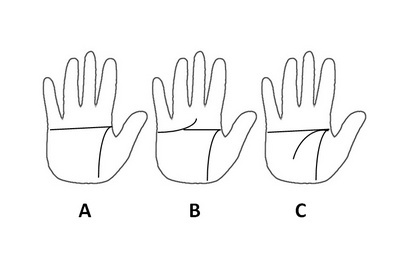 However to make that interpretation, we must also look at the shape of the fingers, etc. Not all people have the simian constellation, but those who do can be considered very stubborn people. These people tend to have long memories, particularly when someone does something wrong to them. They can be bold and daring and seek great personal freedom. They are strong performers and achievers, confident with the ability to lead. They are also frugal people, who are very thrifty and cautious in their spending. But the yang of stubbornness is determination. If a person has both the simian constellation with strong success and fate lines, then the stubborn qualities of the simian constellation turn into a powerful drive and determination for success. Diagram A is the most common simian constellation. These people are aggressive and take up the challenge of life. They are prone to change their job or activities in the need to take up new challenges and advance themselves. There could even be a tendency in females to change partners on a regular basis. However according to the strength of other lines, this could just remain fantasy, rather than the urge to actually change. Diagrams B and C are modifications of the simian constellation, with a very similar temperament. The simian constellation is raw energy. It underlies other constellations and can either add power or negate. The simian line can also be a latent one. However if this constellation synergizes with other lines, a reservoir of latent energy can be tapped to achieve. But beware, like the simian itself, this constellation can be distracting and take people away from what they should be focusing on. So the value of understanding this constellation is understanding some of the basic urges within us and how they relate to our everyday life. The simian constellation gives us a glimpse of the "the animal within us".